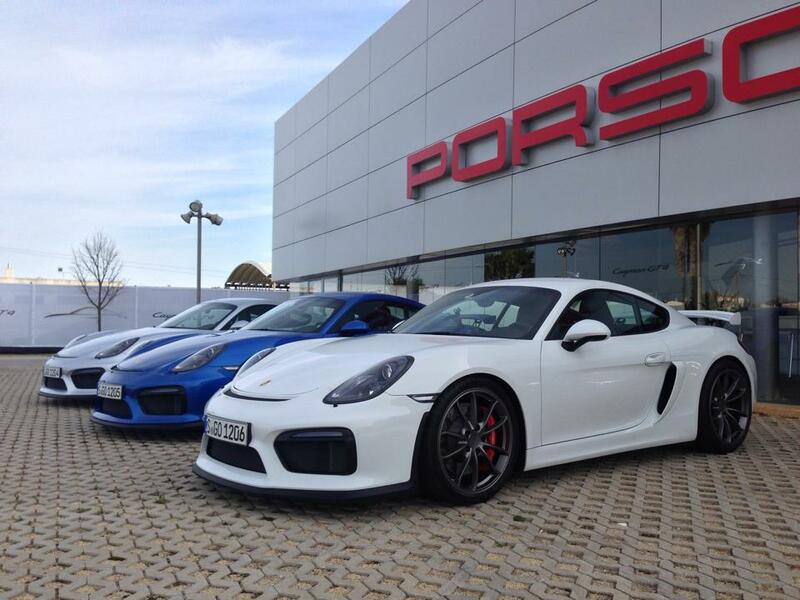 Porsche Panorama editor Pete Stout is currently in Portugal driving the Cayman GT4 for the first time. While you'll no doubt see the full story in a future issue of Panorama, Pete has taken to Porsche Club of America's Facebook page to provide us all live updates during his trip. Head on over if you want to follow in real time or ask him questions! If you just want a summary of what's happening on our Facebook page with regards to the GT4, follow this news article for highlights of Pete's posts, pictures, and his answers to subscribers' questions. End of a long but great day with the GT4—and the big takeaway is that this car is a bullseye. Fantastic on track, great in the canyons, and surprisingly refined on the road. It is fast, its steering is at least as good as the 991 GT3's, the shifter may be Porsche's best to date, it makes great noises, it is remarkably stable yet agile on track (even on Pilot Sport Cup 2s that had seen their best laps before our wave arrived), and is very much a 1:1 car—it feels mechanical and pure, something many enthusiasts have been asking for of late. So there's a lot to love about the GT4, and very little to dislike—it has met or exceeded expectations, and these are very high given its name and who developed it. I could see wanting to shorten gears 2, 3, 4, 5 and then install a taller 6th for sub-3000-rpm freeway cruising, but I'd want to spend time with the car and someone who knows gears very well before playing with the ratios. But hard pulls to redline in third were telling: You're moving, but the tach needle just doesn't sprint from 5000 or 6000 rpm to redline in the way some Porsches do (yes, we've been spoiled by several incredible cars, every GT3 so far among them). After that, criticisms are few, and largely come down to preferences. Thanks for all the great questions, and I hope we've answer most of them. Will check back through when I've got faster Internet. Photos below are the last quick uploads from here in Portugal, with a few for the trackday and tire nerds—from a trackday and tire nerd. I'll add some nerdy comments to go with the latter. And here are some images taken on site, courtesy Porsche. Jonathan Katz (Facebook): Most people interested in buying a GT4 are confident the car will perform brilliantly on the track. The biggest unknown is still how it will perform on the street. One early road test suggested the car is noisy and harsh riding. What do you think? March 6. Pete Stout: @Jonathan: I think one of my earlier posts addresses your question, but here's my take on that: Different testers will have different takes, so that can be frustrating as a reader (I'm one, too). That said, the GT4 will be "hard" to someone who should buy a Cayman GTS with PASM. It will be impressive/amazing/totally livable to someone who should and would buy a 981 with the X73 Sport Suspension. The ride is very much like a 987 Boxster Spyder or Cayman R: You KNOW you are in a sports car, but it's never brittle, hard-edged, or jarring. It's firm, but actually quite refined. In California, even with some of our not-so-great roads, I wouldn't hesitate. In Michigan or New Jersey, it might be a different matter. The mountain roads of Portugal are very similar to those in California, and the GT4 works brilliantly on the lumps and bumps. Brian Pusey (Facebook): Track temp? Factory tires? BTW, thank you for taking "one for the team." A lot of jealous members here stateside. Enjoy the day gentleman. March 6. Pete Stout: Brian Pusey: A pretty much perfect track day. Clear, sunny, and in the low 60s. Factory Pilot Sport Cup 2 tires, maintained by that tire's "papa" engineer. Have some points from him I'll share when I can sit down and brain dump some more! March 6. Pete Stout: No RS planned or in the works at this time. Power is somewhat limited by the Cayman's exhaust arrangement, which has to go up and over the rear axles. No center locks will be available for this car. No functional carbon to speak of as yet, but there's nothing ruling it out in the future as Porsche seeks to reduce weight. The only functional carbon fiber is in the optional 918 seats. One other thing for those wondering (I was): No Noselift option was developed for this car because the system from the 991 GT3 would not fit with the 981 body in white. Jason Darley (Facebook): Are these limited production like the 911 GT3 RS? And regardless, when can we expect to see them at our dealers in the US? March 6. Pete Stout: @Jason: They are not strictly limited to 500 or 600 cars like the GT3 RS 4.0 and the GT2 RS were, but they are somewhat limited due to the supplier chain and planning, as we have seen with regular GT3s and GT3 RSs. It looks like Porsche is able to make about 2,500 GT4s worldwide, but they have been overwhelmed by the response. I doubt this will be a first and last chapter. David Yuen (Facebook): Any Carrera GTS vs. GT4 back-to-back drive comparisons? March 6. Pete Stout: As expected, the car is brilliant on track. And interesting, too. Those who come to the GT4 with no previous experience in a Porsche GT-series car will find it confidence inspiring, sharp, keen, and very comfortable on track — yet there is plenty of "headroom" for more experienced track drivers. Walter Röhrl, no newbie, clearly finds the car to be just plain fun, even after GT3s and 918s, and I'd have to agree. The most interesting takeaway from the day so far is that those who have done the 996-2, 997-1, 997-2, and 991 GT3 progression have been able to work from a building knowledge base, taking lessons learned from each chapter and applying them to the new car. But in the GT4, all you can really work from is Cayman S, X73 (the "analog" shock/suspension package), and/or GTS — the GT4 is something new, clearly keener and sharper in the way of a GT3, but its mid-engined layout makes it a different paradigm. So we're in for a new story, and the first chapter is already very exciting. March 6. Pete Stout: It's Friday morning in Portugal. More track time to come. Peter Moy (Facebook): Don't spend too much time editing video and polishing prose. An immediate brain dump review with shaky cam footage is fine! Christian Asis (Facebook): Can't wait for the review. Lots of pictures and photos please. Any chance of you doing some of us a favor? Lots of us online are trying to figure out if the light weight buckets are safe for booster seats for children. We know they aren't safe for car seats but we also know the new LWB's have weight sensors. We can't get a solid answer out of PCNA yet. I've got my order sheet in, but as a father of a young boy, his safety trumps my desire for those delicious seats. Thanks! March 6. Pete Stout: Christian, I spoke with a Weissach GT4 team member last night, who smiled and said (paraphrasing here), "I have children, too, and yes they will fit and work — so long as they are the Porsche child seats or those that worked with 987/997 sport buckets." He went on to say the inner dimensions (seat centers) are the same as the 987/997 sport buckets. When I asked about both child seats and boosters, he said, yes, so long as they worked before, and also indicated the Porsche child seats are much more likely to be compatible. Of course, this is a German's perspective, and it may or may not apply to U.S. legal and liability issues. I'll look into the latter today. March 5. Pete Stout: Just arrived at the GT4 launch, and we're about to head out.